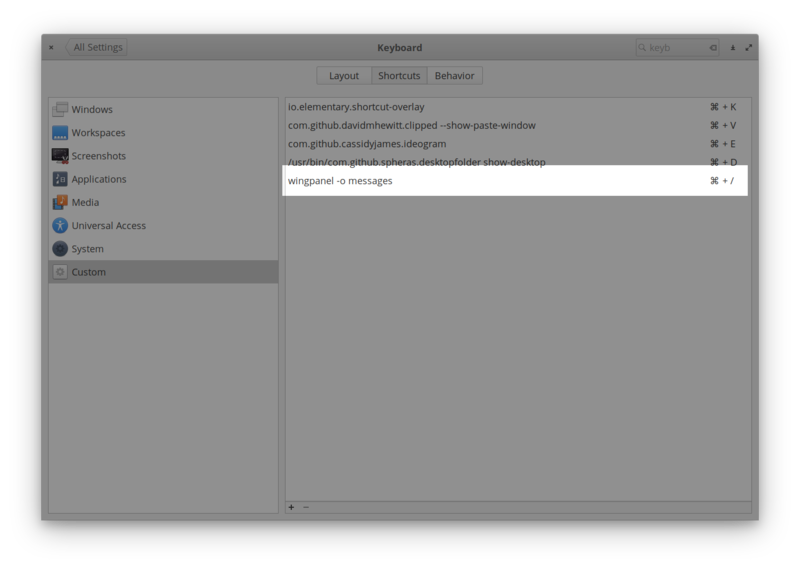 Is there a way to set a keyboard shortcut to show all notifications, i.e. expand the notification bell icon to show all missed notifications. Right now I have to click the bell icon to show all notifications. I would like to be able to do it through the keyboard as well. I've checked in the keyboard shortcut settings but I couldn't find an action. If you open up a terminal and run that, it should work. wingpanel -o messages If you open up a terminal and run that, it should work. Not the answer you're looking for? Browse other questions tagged keyboard-shortcuts notifications or ask your own question. How can I make Ctrl+D not close the tab in Pantheon Terminal? How do you have Ctrl + Alt + T duplicate a terminal tab in Freya? Switch only between windows of the same application (not tabs)?